Have you ever seen someone park in a handicap spot and look perfectly healthy as they step out of the car? You wonder, “They’re not disabled, they can walk just fine! They must have that handicap card illegally.” What most don’t stop to think is that perhaps this individual may have an invisible disease. A disease that causes a brief walk across the parking lot to feel like the equivalent of running the length of a football field five times over while every single joint screams in pain. Those with invisible disabilities can present with varying symptoms such as debilitating pain, fatigue, dizziness, weakness, cognitive dysfunctions (brain fog), learning differences and mental disorders, as well as hearing and vision impairments. Most of these chronic invisible conditions are not always obvious to an observer, but can sometimes or often limit daily activities. These disabling symptoms can range from mild challenges to severe limitations and vary from person to person. Having an invisible illness can prohibit the sufferer from enjoying life in the way they once knew. Unfortunately, people often judge others by what they see, concluding that they are either capable or incapable based on the way they look. It may, therefore, be difficult to understand someone who “looks” fine, but acts incapable. All too often judgments are made that the patient cannot be ill, because they do not look sick, just like in the example in the opening paragraph of this blog. The life of an invisible illness sufferer is riddled with what may feel like a barrage of insensitive encounters and whisperings. Comments are often made as to why they are often absent from the job or even tardy, why they no longer call or are available for social activities with friends, why they often seems short tempered, withdrawn or depressed, or why they lay in bed or the couch so often. The invisible illness sufferer is often labeled as lazy while disease wreaks havoc inside their body. When trying to explain their disability, sufferers are frequently met with the response, “but you look so good.” This is, perhaps, one of the most frustrating things to hear for those who suffer with these invisible illnesses. Unsolicited advice on how to get better only adds to the exasperation. 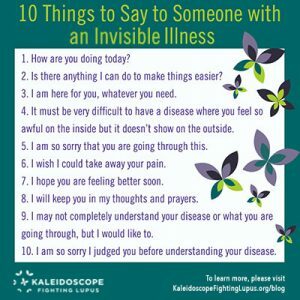 For those that are fortunate to live without an invisible illness, it’s difficult to understand, relate. But we all have had colds, flus, minor distractions, aches and pains, maybe we have even been a tad depressed for a few days, right? Our options to fix our illness might include taking anti-inflammatories, perhaps a soothing bath, a long walk, some choice cold medications, even try to simply get some rest, and withdraw from the world for a day or two, or up to a week if necessary. No one judges us for that and many may even empathize for the few days we feel lousy and under the weather. But like most of the healthy population, we are back on our feet and moving on with our lives in no time. But what if that cold or flu never went away? What if that pain and fatigue never went away or even got worse? What if that period of blues turned into a full-blown depression and couldn’t find a way to see the light at the end of the proverbial tunnel? What then? Imagine the anxiety and depression you may feel knowing that what you have was chronic, had no cure, and that it could potentially be a part of your life forever. Now, envision trying to explain this new painful reality to your family, friends, and co-workers in a way that they would understand when you look perfectly fine on the outside. How would you cope with having a chronic, invisible illness? How would you tell people to make them really understand? Would you be judged as lazy or even crazy? Would you be treated differently? Would you be fired from work for taking too many sick days? Would you be excluded from activities? Would you be pitied or looked down upon? Would it cause stress in your relationships, both personal and professional? These issues and many more, are a daily reality for invisible illness sufferers. 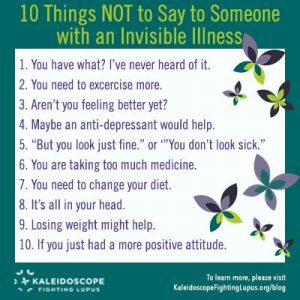 Now that you have a very basic understanding of what invisible illness sufferers face on a daily basis, here are 10 things you could say someone you know who is fighting a chronic invisible disease, the next time you meet. 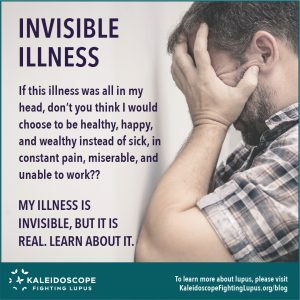 Spreading awareness about invisible illnesses, such as lupus, is the only way to create a more accepting, understanding world with medical and social validation for those who suffer. Please help spread the word by participating in our online community, see the below links! Together we can bring lupus and other chronic invisible illnesses out of the shadows, and into the light.